You don’t have to know loads about mobile technology to enjoy an amazing smartphone. Phone manufacturers like to make their premium phones as user-friendly as possible, because they know that not everyone is a mobile expert. The physical keyboard is something that all BlackBerry devices are famous for. 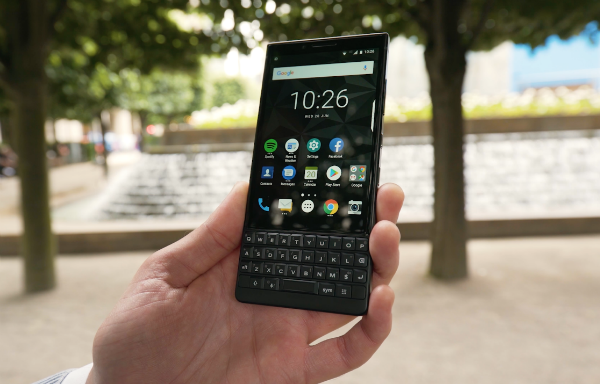 And on the KEY2, it’s been redesigned so that it’s now even easier to use. If you find it difficult typing accurately on touchscreens, this might be your thing. The keyboard also has lots of handy shortcuts that you can easily set up. For example, the new Speed Key lets you access your favourite apps from anywhere. So you can jump straight from Spotify to Facebook in a single click. Another clever thing on the KEY2 is the Smart Battery Experience. This learns your daily charging and usage habits, and suggests when you should charge your handset - so you’ll never run out of power when you need it most. In fact, you can expect up to 2 days of battery life on the KEY2. That’s much more than most other smartphones are capable of. Switching to a new phone can be tricky for some, but the Note8’s Smart Switch makes it a breeze. The app moves all your important contacts, messages, photos and settings from your old phone to your new Note8, so you can pick up where you left off straight away. The Note8’s large 6.3-inch infinity display looks fantastic, and the fact that it’s such a big size means you can do lots on it. Not necessarily with your fingers either, because the Note8 comes with its own magic wand to make lots of actions easy for you. We’re talking about the iconic S Pen. The 0.7mm tip on the S Pen is fine and precise, and you can use it just like a regular pen for taking serious notes during business meetings or lectures. If you make a mistake, just press the button on the side to turn the S Pen into an eraser. The S Pen is great for less serious note-taking, like shopping lists and birthday reminders. You can jot these down on the screen without waking up the Note8, and you can pin them to the Always On Display for at-a-glance viewing. And there’s more. You can use the S Pen to magnify things for a closer look. You can use it to translate text instantly, without having to copy and paste text into Google. And of course, you can doodle and draw to your heart’s content. The Nokia 8 Sirocco is comfortable to hold, and feels like it’s been built to last. The 5.5-inch display is Quad HD OLED, so everything you look at is incredibly sharp, bright and colourful, with deep blacks. The thing that makes this phone so easy to use is Android One, which guarantees you the best version of Android. All of Nokia’s new smartphones have it on board, and it really simplifies everything for you. Google describes Android One as having "everything you want, and nothing you don’t". It makes your phone easy to navigate with no needless apps, and your favourite Google services like YouTube, Google Assistant and Maps are readily available. You also get a full two years of system updates, and monthly security updates. The 5.84-inch display on the Honor 10 stretches from edge-to-edge, and the bezels are slim. So even though the screen is a large one, you can easily hold the phone in one hand. The standout feature on the Honor 10 has to be its stunning dual lens camera. It uses artificial intelligence, so you’ll easily be able to take photos like a pro – even if you’re anything but. The camera's AI can recognise over 500 scenarios across 22 categories, and it then atomatically gives you the best camera settings for the perfect picture. Whether you’re snapping away at your food, you pet cat, or a windswept landscape, your photos will always look their best. You’ll be able to take incredible looking selfies too, with the 3D portrait mode. This has a range of soft lighting effects, and promises to give you professional-grade portraits - even if you're not particularly trying to look your best. Google Pixel 2 is another phone with a great camera. It has a handy feature called Portrait Mode, which adds a professional-looking blur to the background of your snaps, making them look like they were taken on a DSLR camera. You also get unlimited storage in Google Photos. This lets you save all your photos and videos in their original quality, so you’ll never have to delete photos again. Google Photos also makes it really easy for you to organise everything, and quickly find any photo you’re looking for. Then there’s Google Assistant, built into every Pixel 2. You can use this voice-activated assistant to send texts, take selfies, find the quickest way home, or get answers to pretty much any question you can think of. And thanks to the Pixel 2’s innovative Active Edge design, you can call up Google Assistant by giving your phone a squeeze. That’s all it takes. Do you have any other suggestions for this list? What's your favourite easy-to-use smartphone? We'd love to hear what you think, so feel free to comment below.